The story of Peter Recognized Jesus found in Luke 5 is a wonderful example of how Jesus will build our faith. When the disciples thought Jesus was gone he showed up just in time and Peter had the faith to recognize him. 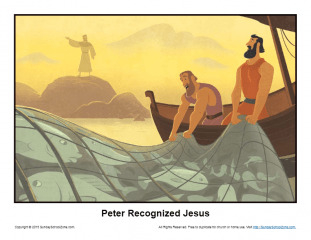 This illustration shows Peter pulling in fishing nets when Jesus appeared. It can be used as part of a Bible teaching session or as part of a children’s sermon.